The Orcs Nest Shoppe was established in 1987. Here are details of how to find us in London and our opening hours. The Orcs Nest Shop in all its blackness. The easiest way to get to the Orcs Nest shop is by London Underground. Go to Leicester Square underground station, and go out the Charing Cross Road East exit. When you get to the street turn right on Charing Cross Road. Walk up Charing Cross Road until you come to Shaftesbury Avenue. You will see the Palace Theatre which is the really big red brick building with a statute holding a flame on the top. Turn right, and we are at the end of Earlham Street just past the Brewdog Pub. 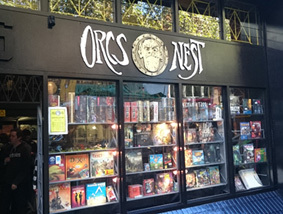 The ORCS NEST is the shop painted black, with the Orc's face hanging outside! Sorry if that seems a bit strange, but any whole email address on these pages is always spammed out of existence! If you do email us, please bear in mind that we are primarily a small retail shop. We do not have any staff dedicated to replying to customers emails and we do have other jobs and customers to attend to. We will attempt to reply to your queries as soon as we can, but do not expect an immediate reply. Thanks. We might not be the biggest games shop in the world, but we do like to think we are one of the coolest! Watch out for the Damoclesian D20 of Death light fitting!